As active managers, we also believe in active oversight of the management of companies in which we invest. We vote on all issues on every stock that we own and are keen to engage with companies on a regular basis, across all our strategies. 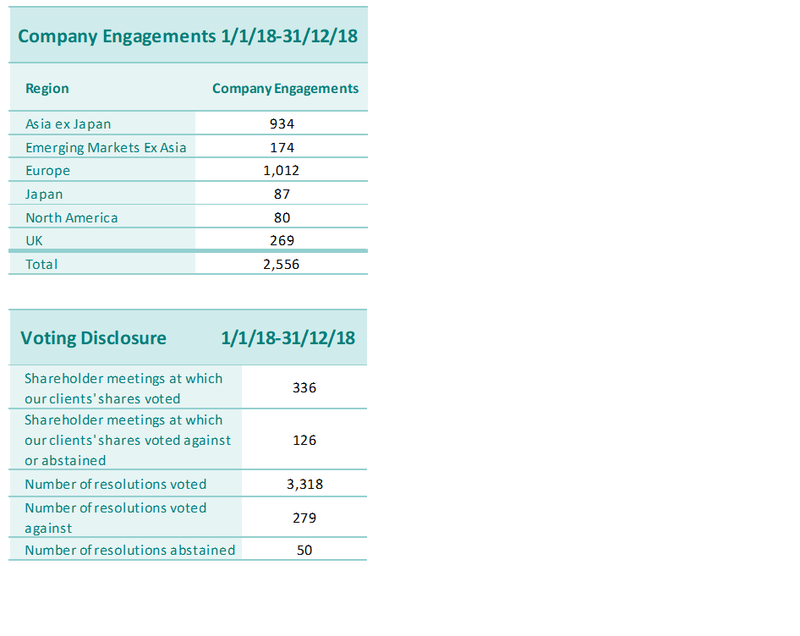 Statistics for company engagements and voting disclosures are shown below. Please see our full Proxy Voting Policy. At TT we believe that high standards of corporate responsibility make good business sense and have the potential to protect and enhance long term investment returns. We are therefore a signatory to the UNPRI, are supportive of the UK Stewardship Code, and are compliant with the Local Government Pension Scheme Advisory Board's Code of Transparency. Environmental, Social and Governance considerations are a key component in the investment processes of all our long-only strategies. An assessment of the opportunities and threats that these factors may pose is integrated within our analysis of each new stock idea being considered. Please see our full ESG Policy.